LANSING, Mich. - May 18, 2016 - PRLog -- Collective Development Inc. a Michigan-based entertainment company that specializes in motion picture production has aligned itself with Forj Digital. The company will distribute Collective Development's library soundtracks to streaming platforms worldwide. "We've always strived to create and distribute our content to a greater world audience. I'm excited that this partnership will extend our reach even further." Forj Digital also will distribute ringtones, ringbacks, wallpapers and other such audio content. The first film soundtrack releases today! 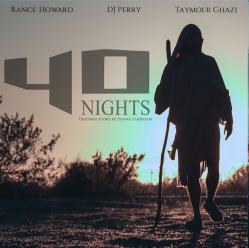 It is the hauntingly beautiful soundtrack to the biblical epic "40 Nights" part one of a three-part trilogy. Dennis Therrian composed the musical score for "40 Nights". Mr. Therrian a long time Collective Development Inc. collaborator is the artist behind many of the film soundtracks. The next release under the new deal will be the soundtrack for "Bestseller" the thriller based upon Christopher Knight's book of the same name. Country Music Stalwart Trace Adkins Joins Collective Development Incorporated's "Wild Faith"